I'm currently waiting for my iPhone to update to iOS 10 and it is taking forever. It looks like the white status bar is not moved a millimeter for ten minutes. I haven't updated my phone for several renditions of iOS so I'm thinking that may be the hold up, but who knows. Speaking of technology, has anyone gotten the iPhone 7? I'll be up for a phone upgrade soon but the thought of parting with my headphones as we know them sounds painful to me. As much as I get annoyed about the wires getting tangled all the time, I like having them attached to something. Also speaking of technology, I've been feeling concerned lately about the amount of time I spend on all of my devices. I'm nervous that it's been affecting my sleep, happiness, and just general ability to focus on a task without getting distracted and reaching for my phone. Between work and my social life, I feel like I'm constantly on the phone or looking at screens and I'm trying to be conscious of cutting back on these habits. Relatedly, it seems like everything is moving towards always being connected which is stressful! I have to admit that I haven't tried the Instagram Stories feature yet, simply because it seems like overload. When did the world change and we started feeling the need to document every single thing that we do? Although the Stories feature is fascinating, sometimes I simply do not care to see what people are doing every minute of their day. In general, I have a love-hate relationship with Instagram because I feel like it makes me obsessive about how certain things in my life look. I try to save it for just my food photography or other moments where I have a chance to snap a picture, and I fully acknowledge that my feed is definitely a curated and unrealistic version of my life. Sure, I'll take pretty pictures of a meal I just made, but what people are not seeing is the more normal situation of me eating the most seriously depressing lunch every day at work, spilling all over myself, running around like a crazy person, etc. I love the discoverability that Instagram allows, especially looking at beautiful food and travel photos and getting new ideas and or inspiration, but I'm trying to reposition the way that I use it in my life. I'm not against Instagram stories at all and I would gladly give it a try - I am just hesitant about spreading myself too thin between multiple apps. My Instagram pictures are just a tiny snapshot of what I'm doing that I've edited to look super nice. I know that mostly everyone does not care what I am doing all the time, and frankly I don't feel the need to document everything. This past weekend I went home to my parent's house in Connecticut and it was a great opportunity to unplug for a bit. Recently I've written on here about how I'm trying to be more in the moment, and not overloading on technology is a way that I'm trying to do that. It was so nice while being at home to have no one to contact, no where to be, and just to spend an afternoon sitting on the couch reading, or laughing about something stupid with my parents and sister. I'm back in Brooklyn now feeling refreshed for the upcoming week. Happy Monday, everyone! I will pretty much eat anything that comes out of the ocean (although laying off calamari for a while, since I got food poisoning a couple weeks ago from it) and mussels are one of my all time favorites. 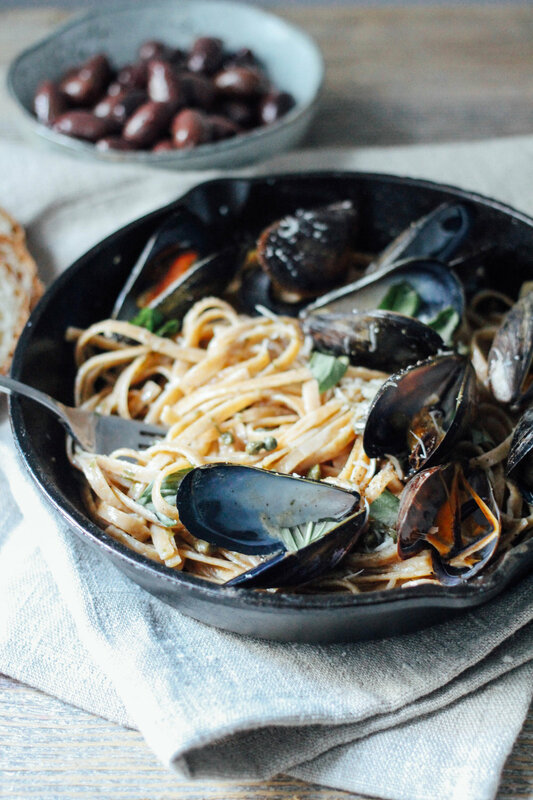 Growing up in an Italian family, pasta was pretty much always the number one option and in the summer especially, my parents would always whip up a big batch of fettuccine, linguini, or spaghetti, and add in fresh seafood. It may be September now, but the weather has been so nice and it won't stop me from enjoying mussels. This version is light - well, as light as pasta can be - with a slightly creamy and acidic sauce. In a large pot, bring water to a boil and cook fettuccine according to instructions. Make sure it stays al dente. Once done, drain it, add a drizzle of olive oil, and set aside. In a double boiler, start heating up water. In a cast iron skillet add olive oil and garlic and cook until simmering. Add in white wine and spices, half of fresh basil, and keep stirring. Once it reduces a bit, add in the heavy cream and most of cheese and continue stirring until thickened. Go back to the double boiler to check on water status. Once the water is boiling, add in the cleaned mussels to the second level and cover. In the cast iron skillet, add in fettuccine and fold into the sauce so that it is evenly coated. 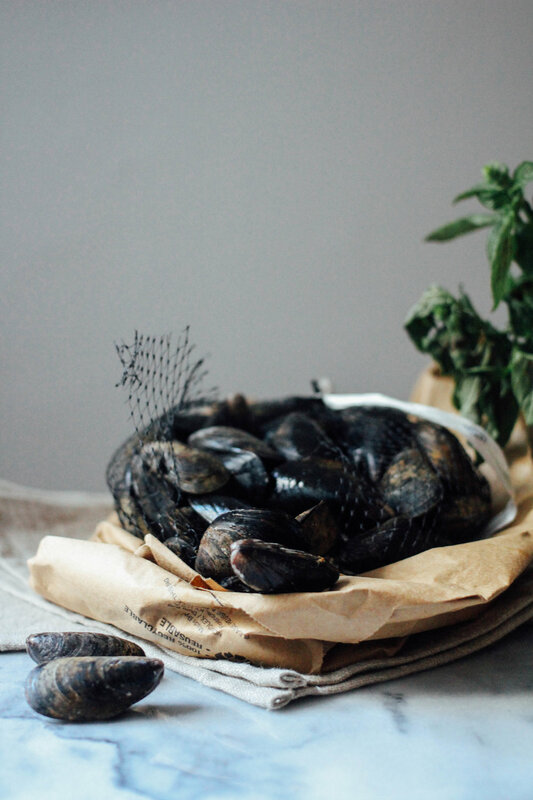 Once mussels open up, remove from the heat and drain those as well. Throw out any mussels that did not open (they are bad). Top the pasta with hot mussels, and garnish with capers, and remainder of cheese and fresh basil. Eat while hot!